The Scripts Manager dialog box lets you select a script, customize it and add it to the Script toolbar for quickly running a script. You can also execute a selected script. The Scripts Manager dialog box displays. 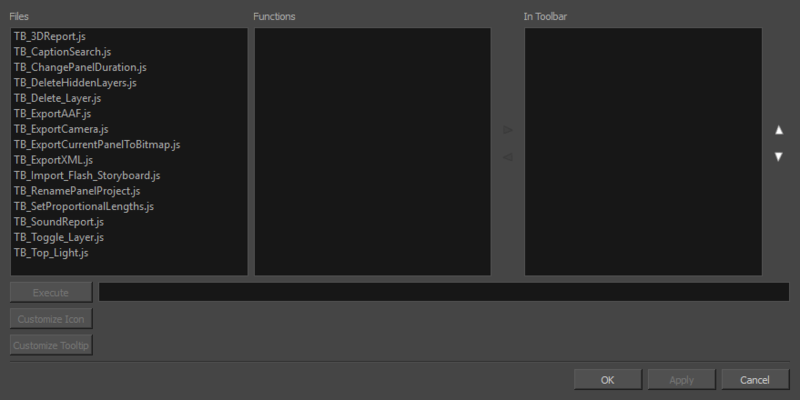 Functions in the Scripting toolbar. Left/Right: Lets you add or remove a selected function from the Scripting toolbar. Up/Down: Lets you reorder the functions in the Scripting toolbar. Lets you select an icon to represent the selected function that will be added to the Scripting toolbar. Lets you add a tooltip to the button to identify and describe the function .